In Part 1 I described the terroir and grape varieties in Bali, a true example of the rare art of tropical viticulture. Now this blog is about the wineries on this Island of the Gods. There are two main wineries, using locally grown grapes, plus Plaga Wine, which uses only imported concentrated juice (thus avoiding customs and excise duty). 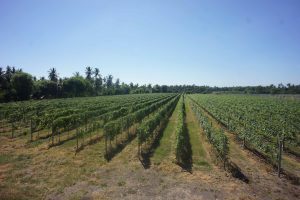 Hatten Wines are the pioneers of modern Balinese wine, founded in 1994 with the help of Charentes winemaker Vincent Desplat. They have a vineyard at Sanggalangit and two at Ume Anyar, totalling 50 ha, with three harvests per year. They grow all their own white grapes – Belgia and Probolinggo Biru – and some black Alphonse Lavallée, the rest being bought in from farmers. The winemaker since 2012, Australian James Kalleske, was previously at Rockfield Estate and Thompson Estate in Margaret River. 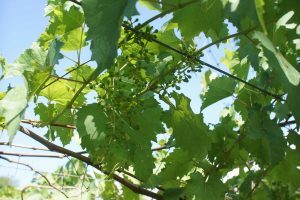 Hatten are testing many new grape varieties and are involved in various other programmes such as reviving the dwindling but crucial bee population. The main showroom and wine classroom are in Sanur, as is the winery nearby, and there is a smaller visitor centre at the Sanggalangit vineyard. I visited the Sanggalangit vineyard, which is on the North coast, on flat land not far back from the sea. This was the first surprise, as I imagined that the vineyard would be planted on the volcanic slopes in plain view further inland. In fact, the soil didn’t look the least bit volcanic, but very similar to the stony brown earth of my garden in London. Indeed, the topsoil is a sandy loam with about 15% clay content, though the bedrock is volcanic. A couple of workers were tending the vines while the vineyard supervisor, Kadek, was waiting for me at the tiny visitor centre. It was mid-morning and the thermometer pinned to the entrance read 36°C but that, of course, was in the shade! The vines were wire trained, some as pergolas but all with generous leaf cover to provide some protection from the burning sun. It was strange to see the neat rows of vines planted where palm trees once stood, and which still provide the backdrop. The following day in the modern winery in Sanur, James explained to me that, despite the high temperatures, ripening is difficult because the days are short, with close to 12 hours of daylight throughout the year, and dark after about 6:30pm. And as for the volcanic slopes, vines have been tried there, but fell prey to the dripping humidity. Hatten’s Two Islands and Two Islands Reserve use only imported Australian must and juice, but the main label is from the local fruit. The range comprises the sparkling white Tunjung, sparkling rosé Jepun, dry white Aga, off-dry white Alexandria and red Aga aged with French oak. There is also an alluring sweet Pino de Bali, initially made from the unfermented juice of Belgia and Alphonse Lavallée, after which it is fortified with local brandy (like the aperitif Pineau de Charentes), but then matured for five years in a solera of old French oak barrels to achieve a rancio style. I thought both the whites and reds to be very good, but the Jepun was particularly lovely (like a peach-scented Champagne) and Pino de Bali a totally unexpected pleasure. Established in 2010, Sabaya buys grapes from local growers (Belgia and Alphonse Lavallée) but also has its own Asteroid R&D vineyard, where it is trialling reduction to two harvests annually in pursuit of quality. The Velvet Series includes White Velvet, Pink Blossom and Black Velvet; there is a Reserve Red and two sweet wines: Moscato d’Bali (a blend of still and sparkling wine) and the sweet red Ludisia. I didn’t get to visit Sababay but hope to next time in Bali. Hatten, Sababay and Plaga wines can all be found in the local restaurants at very reasonable prices so look out for them next time you ‘find yourself’ in Bali.